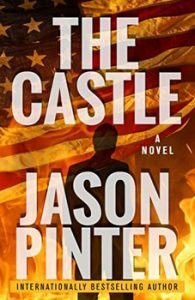 Jason Pinter’s The Castle is a tense, fast-moving thriller, a nightmare journey through a contemporary political world that is all too alarmingly familiar to us. Having written the book during the bizarre electoral circus that culminated in the victory of Donald Trump, Pinter “wanted people to be able to read it now right in the wake of the election” (Hudson Reporter), so opted to avoid the delays of conventional publishing by creating a new company, Armina Press, which was able to bring the novel out in June 2017. In the months following Trump’s election, many have echoed the question posed by the journalist and thriller writer, Jonathan Freedland: “How could any fiction come up with a drama as lurid and compelling as the nightly news from the US?” When the highest office is gained by a chaotic, ignorant, paranoid narcissist, wielding his power with no apparent moral compass, how is it possible to incorporate such a reality into the fictional world of the political thriller? How does a novelist give urgency to his plot when all taboos seem already to have been broken, all lines crossed? The approach of The Castle to this formidable task is bold and effective. An action-packed thriller can’t really afford to wade into the sort of political quagmire that has been created by the real-life model for Pinter’s man of power. In constructing The Castle, Pinter’s key move is to excise some of the more repetitive and exhausting aspects of the politician represented – the childish petulance, wild inconsistencies, insecurity, absurd lies and weak excuses. Instead, Rawson Griggs, the billionaire arch villain of The Castle, is sharply intelligent and focused – a far more competent and altogether more coherent adversary: “Rawson does what it takes to win. It’s not always pretty. But it’s effective.” There is abundant common ground between actual and fictional worlds: Griggs is bullying, self-centred, hubristic and paranoid. But although this utterly unscrupulous manipulator habitually deceives people, his lies are cunning rather than transparent. His deceptions are the Machiavellian manoeuvres of a strong, determined political operator who, behind the scenes, threatens everyone around him. The protagonist drawn into this arrogant, aggressive world is Remy Stanton, a young corporate strategist who, in a moment of rash daring, intervenes to rescue two strangers being attacked by a gunman. When it turns out that the lives he has saved are those of Griggs’ daughter and son-in-law, Remy suddenly finds himself a central figure in the third-party political campaign of the powerful business magnate. He is a useful hero of the hour, with a clear role to play in the supporting cast of a populist, nativist bid for the presidency.